World’s first LNG powered RoRo vessel is to be built in India for Sea-Cargo AS of Norway. LNG powered vessels are environment friendly as CO2 emission will be reduced by about 20 percent, NOx by about 90 percent, particulates negligible and sulphur oxide emissions will be zero. First two vessels are scheduled to be delivered in 2009 and 2010 with option to build four more vessels. 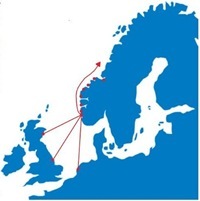 Sea-Cargo AS regularly operates a fleet of multipurpose RoRo vessels, primarily on North Sea routes linking the west coast of Norway, mainland Europe and the UK. The new vessels are also expected to operate on weekly service in the same route. The design is jointly developed by Sea-Cargo, Seatrans and Rolls-Royce. Rolls-Royce will supply all main engine, propulsion, steering gear, shaft generator, engine automation including LNG fuel storage and handling system. To be built in India by Bharati Shipyard Limited. Bharati Shipyard is having shipyards at Ratnagiri, Ghodbunder – Thane, Kolkatta and Goa. Cold liquid natural gas will be stored in two insulated LNG tanks each 240 cubic metres forward of the engine room, in a ventilated enclosure. Here is an image from Sea-Cargo of the proposed LNG powered RoRo vessel . Read more from Sea-Cargo and Baird Online. Bharati Shipyard has confirmed that the shipyard has received orders to build two LNG poewered Roll on-Roll off (Ro Ro) vessels from Norway-based Sea Cargo AS. The vessels are in design stage and construction of the vessels would start from mid 2009 and the delivery of the vessels is expected during the second half of 2010. It would be the first vessels to be built in the world as per new IMO regulations of inherent gas safe concept. Each of the vessel is estimated to cost $40 million. Read more from The Economic Times.